Our B. Des. 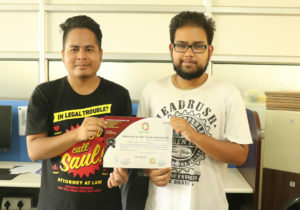 3rd year students Arunabh Choudhury and Sandipan Bhattacherjee won the Best Poster display at ASSET 2018 National Conference held in the month of March 2018 at Central Institute Technology, Kokrajhar. Title of poster: A Novel Way to Teach 3D Modeling for 3D Animation in Maya. About: The poster presented a novel communicative approach for teaching the confidence of creating 3D character-based models using Polygon and NURBS in Maya with the concept of interchanging the 3D design platform and format. Copyright © Dept. of Multimedia Communication and Design | Designed by Dhrubajyoti Borah under the guidance of Abhijit Padun (Assistant Prof.).